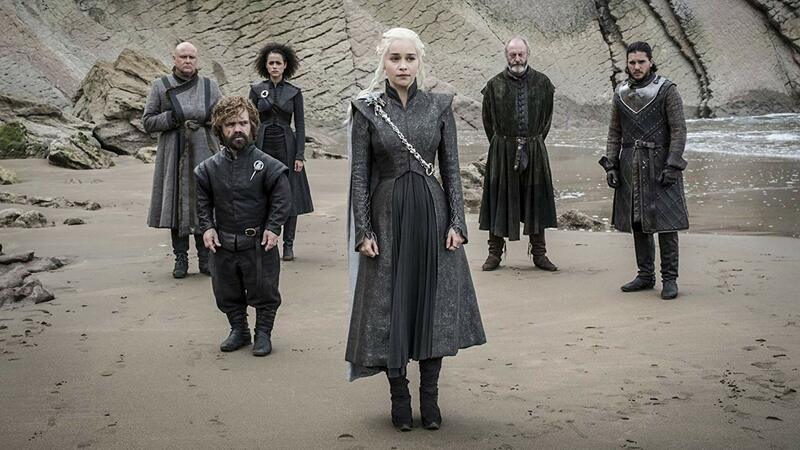 When the eighth and final season of HBO’s Game of Thrones premieres on April 14, we will finally learn who wins the Iron Throne. We’ll also see our remaining faves for the last time, whether they live or die, so it’s probably a good idea to stock up on tissues now. After all, with a 54-minute premiere followed by five episodes ranging from an hour to 85 minutes each, the final season is sure to be jam-packed with action, emotion and hopefully, a satisfying ending. Of course, there are tons of theories about what could happen in GoT season eight, including some truly wild ones. Heading into the final weeks before we learn what’s true and what isn’t, we’ve rounded up eight theories about what could happen in GoT‘s last hurrah. Some of these are truly out there, but as we’ve learned time and time again on this show: nothing is too out there for novelist George R. R. Martin or showrunners David Benioff and D.B. Weiss. Here are the most compelling theories we could find. 1. No one rules from the Iron Throne. 2. Bran is the Night King. Bran Stark (Isaac Hempstead Wright) has had prophetic dreams since the series premiered in 2011 and it’s definitely clear by now that he is the three-eyed raven. However, there is also a theory that Bran is the Night King, too, according to at least one Redditor. The theory purports that when the three-eyed raven tells Bran he will never walk again, but he will fly, it’s not because he warps into a dragon, as many fans believe. It’s because he travels back in time in an attempt to stop the Night King and his Army of the Dead from marching on Westeros, only to get stuck in the Night King and become him instead. 3. Arya is going to kill Cersei. Although the set-up is in place for Jamie Lannister (Nikolaj Coster-Waldau) to kill his sister/lover, Cersei Lanniser (Lena Headey), therefore fulfilling part of Maggy the Frog’s prophecy, this hasn’t come to pass yet. In season seven, Cersei decides to let everyone else fight the Night King, which caused Jaime to leave, apparently abandoning her and their unborn child to ride north. If he makes it to Winterfell, he’ll be in the same place as Arya Stark (Maisie Williams), who could kill Jaime, take his face, then get close to Cersei in order to murder her. This would both fulfill the prophecy and mark another name off of Arya’s list. 4. Tyrion is secretly a Targaryen. Targaryens could continue to be revealed in season eight. Many fans believe that Tyrion Lannister (Peter Dinklage) isn’t a Lannister at all. As explained on the fan site Winter Is Coming, some think that Tyrion is actually the legitimate heir of Aerys “The Mad King” Targaryen, which would explain why Daenerys’ dragons took to him in season six rather than frying him extra-crispy. This theory has been around since well before the series premiered in 2011, dating all the way back to when Martin’s books started coming out in the ’90s. Dinklage hasn’t indicated anything about Tyrion’s fate, except to say the series “ends beautifully for my character whether it be tragic or not.” Whether Lannister or Targaryen, there’s a definite possibility that Tyrion will not live to see the end of the war. 5. Jon will marry Cersei to save Westeros. This theory first surfaced in 2017 on Reddit and it boils down to this: Jon Snow (Kit Harington) is the son of the man Cersei wanted to marry and the woman her late husband loved until his death. When Cersei asked Maggy the Frog if she would marry the prince, she was told she would marry the king and she did; she married Robert Baratheon. However, if Jon wins the Iron Throne when all is said and done and Daenerys is dead or things just don’t work out, perhaps Cersei will see reason to suggest a union to maintain peace. 6. Sansa could rule from the Iron Throne. Turner revealed in February that Sansa finally gets to put on armor in season eight. Could it be that the divisive ending Turner teased last year is Sansa laying claim to the throne? With Littlefinger dead, it’s true that there is no immediate threat to her safety at the moment and Sansa has proven that she is capable of adapting, learning and surviving no matter what gets thrown at her. Perhaps she’ll not only live, but become the ruler of Westeros, too. 7. Robb Stark is alive. We all saw Robb Stark (Richard Madden) get brutally murdered at the Red Wedding in season three, along with his mother, his wife and their unborn child. However, there’s a long-running theory, dating back to when the books were first released, that Robb warged into his direwolf, Grey Wind, then warged into a different animal when the direwolf was killed, too. Therefore, Robb could be alive in the form of some kind of animal, though that doesn’t mean he’ll necessarily reappear in season eight. It just means we don’t have to be quite so sad about his death. 8. Jon is Azor Ahai and he will sacrifice Daenerys. There’s good evidence that Jon Snow is the hero Azor Ahai reborn, largely because every time Melisandre tries to see the former in her magic flames, she only sees the latter. The question of who could be Azor Ahai has plagued Game of Thrones for years and season eight will be the last chance for his identity to be revealed. If Jon is Azor Ahai, there’s a high likelihood that he’ll have to sacrifice Daenerys in order to fight back the forces of darkness threatening to overtake Westeros. Jon and Daenerys have already lost their first loves under tragic circumstances. It’s unlikely that they will both live until the end of season eight, especially if the first part of this theory turns out to be true.